Saves space, secure, always correctly fitted, 5 point harness until 12. The Multimac is a multistage child car seat that allows you to fit three or four children across the back seat of almost any car. When you buy a Multimac seat you can get it fitted my professional Multimac agents for £99. However, if you prefer to fit the car seat yourself it's worth noting that the seat will not attach to ISOFIX points. Yes, the Multimac feels completley sturdy - when it is strapped in there is no way I can budge it even a centimetre. Yes, it is. You do have to use the Minimac infant seat, which is available on the Multimac website. The aptly named Minimac (Multimac's infant car seat) costs an additional £269 and is suitable from birth to 13kg, around 12-15 months. It is still removable however and has carry straps to take it out the car if you want to. No, it doesn't offer rear-facing for long. The Minimac seat can face rearward to 13kg which is approximately 12-15 months. The infant seat isn’t huge though and I will be surprised if my 9 month old still fits in there at that age. My only real negative for the Multimac is the lack of an extended rear facing option. However, when they get older than 15 months and they move into the second stage of the seat, it's worth noting that the seats don’t recline so the only option is upright. The fact that children over 18 months need to be forward facing - it is pretty much the only negative I have. Anyone with a larger family - we have a seven seater but this seat allows us the entire boot so we can easily take a double buggy, suitcases and everything else in there. Prices vary depending on the exact model you choose but ours was £1499. At first it sounds expensive, but when you think about it, the least you can spend on one all-stage car seat would be £200, if you had to get three of them, that would cost you £600. However, it's sort of a moot point, as you wouldn't be able to fit 3 in the back of any car anyway. 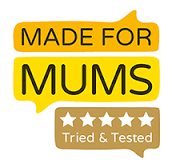 So for what it is, a tailor-made, safe, easy-to-use car seat that will fit 3 or 4 babies, toddlers or children in the car at the same time, it's priceless and I actually think it is exceptional value. And the Minmac is £269 which is inline with other infant carriers. The only expensive extra are the headrests, which are an additional £59 each.